Predator hunting takes a little bit different technique than hunting big game or prey type game. This is due to the fact that predators tend to stay better concealed and are typically quieter and more cautious. You can usually spot deer that are around you easily but can be a few yards from a mountain lion and never know it’s there. Predators also are better equipped for and more likely to retaliate if wounded, which is an important factor to keep in mind if in close proximity. Any scope that you use would need to be designed for quick target acquisition, low light conditions, variable short to long range and rugged. Follow along and check out our top 5 best predator scopes that will make your hunt easier. Predators are equipped with all kinds of super adaptations that make them nearly invisible and absolutely lethal in order for them to successfully hunt and capture prey. They are very good at it. They have to be, otherwise, they don’t eat. This is why hunting them can be quite a challenge. For the most part, predators are shy and tend to stay away from humans. They are exceptionally quiet when moving around, have a very keen sense of smell and can quickly detect movement. Usually, if you are in the area they won’t be. While hunting them you need to be quiet, patient and have some kind of way to mask your scent. If the predator sees movement, they will usually freeze or crouch under cover. Once they identify you, they will quickly retreat, so your scope would need not only to be able to quickly acquire your target but be able to track it as well. This also would be where low light, failing light scopes, or a killflash would be useful, as part of the predator’s cover is to move about during these dark hours. It’s the best hunting time for them. Fangs, claws, and agility are things that predatory animals bring to the table, so having a scope that holds zero well would be appreciated in making a clean, fatal shot the first time. You definitely want to try to not be within viewing or striking distance if you make a bad shot. And you also don’t want to be unfortunate enough to walk up on or corner a predator once you’ve injured it. It may not be all too horrific if you’re hunting coyotes but try that tactic with something like a bear. That’s a scenario you’d never want to try twice. When predator hunting you never know what distance you will actually be hunting at and need to be prepared for a little versatility. Ideally, it will be mid to long-range where you can set a predator call, then hunker down somewhere a bit more comfortably and wait. Many hunters, however, use hand-held predator calls, which leads the predator right to you. You may not see them until they are in ambush-mode. This is why having a scope that can accommodate both short-range, mid-range, and long-range are gems to have. Repeatable, resettable ranging and good parallax diversity are what you need to quickly change your scoping range. Remember that most predators can out-camouflage you. They blend magically with their surroundings and move cautiously. They take advantage of rocks, hills, heavy brush, trees, you name it. Being masters of camouflage, they are also masters of spotting other camouflaged predators. Any flicker of movement, flash of the lens, sniffle or cough, smell of sweat, or even unnatural outline can ruin your hunt. You need to be prepared for concealing these things to be successful. Some valuable and necessary accessories you would want to maintain your cover would be correct colored camouflage, broken, or shaded clothing and coloration for your rifle and scope, an anti-reflective device, and a rifle rest or bi-pod. Making sure you’re in the correct position as far as wind goes will go a long way to mask your scent. Make sure, also, that you are strategically placed so as not to be ambushed and conduct your hunt as safely as possible. The Vortex Optics Strike Eagle is a second focal plane, variable 1-6x24mm and is the picture of speed and versatility. It has a true 1x power that allows for quick target acquisition at close quarters while adjusting all the way to 6x power for longer distance targets. The lenses are high-quality and fully multi-coated for clear, crisp sight picture and optimal low-light performance. A fast-focus dial on the eyepiece sharpens the reticle when needed. This reticle is perfect for changing light conditions with an illuminated, glass-etched BDC reticle with 11 illumination settings. An extra battery can be stored in the windage cap in case you need to change the battery in the field. The Vortex Strike Eagle is a rugged scope that withstands recoil and impact, made of a single-piece, aircraft-grade aluminum tube with a hard-anodized finish in matte pattern that cuts down on glare. It is O-ring sealed and nitrogen purged to be waterproof, fog proof and shockproof. Capped reset turrets protect the adjustments from impact and elements. These turrets are resettable to zero after sighting in. Finally, it comes with a solid holding 2-inch offset cantilever scope mount. 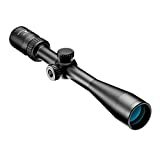 Customers seem to really like this scope, bragging about the high-quality, clear glass, the overall toughness, excellent true 1x power setting and the multi-illumination settings. They also rave about the die-hard Vortex lifetime warranty, that is transferable and will fix or replace your scope for pretty much any reason at all. Customer complaints are varied and individual. One complaint was that the scope and mount combination as a whole is overpriced and can be purchased much cheaper individually. The TRUGLO TRU-Bright 30 series scope is a 1-6x powered scope with a red and green dual-color illuminated duplex MIL-Dot reticle. A standard black reticle is visible without illumination. Included are two pre-calibrated BDC turrets in calibers .223 and .308 which can engage targets up to 800-yards away. The TRUGLO is designed with a bright 24mm objective lens on a 30mm tube for increased brightness and ½ MOA windage and elevation click adjustments. The 1x power setting is true, allowing for extremely fast target acquisition and great sight picture, even with both eyes open. Included is a tough, aircraft-grade aluminum, reversible and offset, monolithic scope mount. 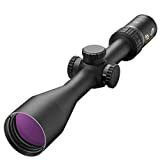 Customers of this scope are surprised by the brightness and clarity of the glass. It’s a tough little unit that holds its own well when treated less than gently. Also, people like that it’s a budget pick. This scope has a few consistent customer complaints including the mount not fitting on a Picatinny rail and the customer having to purchase different rings, little or no eye relief, and faulty turret adjustments that free-spin. Related Read: Best Scope For 308 Bolt Action Rifle. The Burris Predator Quest is a simple, yet attractive 4.5-14x42mm scope. It features the Ballistic Plex E1 reticle which rapidly compensates for wind, elevation and loping coyotes out to 500 yards. Exposed tactical adjustment turrets are easy to quickly adjust with your fingers, and the tactical side parallax adjustment knob adjusts from 50-yards to infinity. This scope is pretty rugged, being waterproof, fog proof and shock resistant. The high-grade optical glass is very clear and crisp, and larger at 42mm for inclusion of extra light and brightness. This scope also includes an anti-reflective device that removes glare and allows for greater concealment from detection. It’s backed by the Burris Forever Warranty. Customers of this scope love the amount of light that it takes in and the clarity of the glass. Most agree that it is a very dependable scope. Any complaints found were isolated issues and inconsistent. The Primary Arms GEN III is a 1-6x24mm, second focal plane rifle scope that is rugged and durable. It is constructed of 6063 aluminum in anodized matte black and is nitrogen purged to make it waterproof and fog resistant, is shockproof and has scratch resistant optics. It is protected by a limited lifetime warranty. The Primary Arms GEN III features an ACSS predator reticle that is designed with coyote and hog hunters in mind, with an auto-ranging base on a 10-inch circle that allows for incredible speed when ranging. The reticle is illuminated in red or green with 10 different brightness settings, powered by a single CR2032 3V lithium-ion battery, which is included. Most express that this is a great optic for the money. They say that it zeros easily and holds zero well, and the reticle is easy and convenient to use. The glass is crisp and clear. For the most part, there are no real complaints. Some have noticed that the reticle washes out or bleeds a bit in the sunlight. The Nikon Prostaff P3 Predator Hunter is a 4-12x40mm scope with a BDC Predator reticle that is designed to facilitate shots at fast-moving targets with unique, open circle aiming points that don’t obscure the target, and a fully multi-coated optics system with multiple layers of anti-reflective compounds on every glass surface to provide clear, bright sight pictures, optimum light transmission, and maximum dawn to dusk brightness capabilities. The rugged 1-inch single-piece, aircraft-grade aluminum body is enhanced with an aluminum quick-focus eyepiece, and generous, consistent eye relief. It also features hand turn ¼ MOA adjustments and spring-loaded instant zero-reset turrets that can be reset to zero after sighting in for easy reference when making field adjustments. The reticle can also be optimized for virtually any caliber with Nikon’s Spot On Ballistic Match Technology. This is a very new product with not many customers yet. Established customers really like the open circle reticle style and say it make for easy and quick targeting. No negative complaints noted. Hopefully, you now have a better idea of what would be the best predator scope and some of the important factors for a successful predator hunt. Safety is key, then to enjoy yourself. After that, any one of these scopes will help you achieve the best results!